Samsung remained the most popular phone maker in the U.S. in the third quarter, but Apple is slowly closing in, the latest comScore MobiLens report finds. With a couple of successful smartphones under its belt this year, such as the Galaxy S III and Galaxy Note II, Samsung ranked as the top smartphone manufacturer with more than 26 percent of the U.S. market, an increase of 0.7 percentage points. Apple is still a distant second at 17.8 percent after a 1.5 percent increase, which helped the company outrank LG by 0.2 percentage points as the number two phone maker. 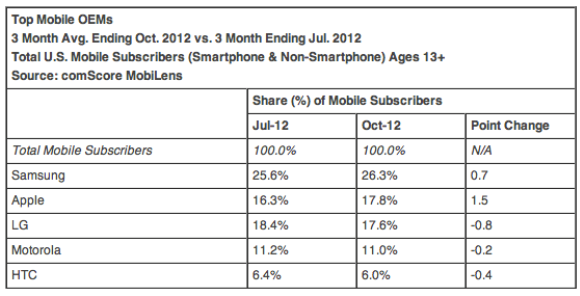 LG dropped almost 1 percent in the three months ending in October 2012. Motorola and HTC, number four with 11 percent and number five with 6 percent, haven also seen small declines in mobile share in the third quarter, compared to the three months to July 2012. If you look at the mobile OS market share figures, you will also find that Android is dominating with 53.6 percent share after a 1.4 percent increase, but Apple is a closer second in this category, with a 34.3 percent share after a 0.9 percent increase this quarter. Meanwhile, Research In Motion's BlackBerry retains 7.8 percent of the market and Microsoft Windows Phone had a slight decline, again, to 3.2 percent. 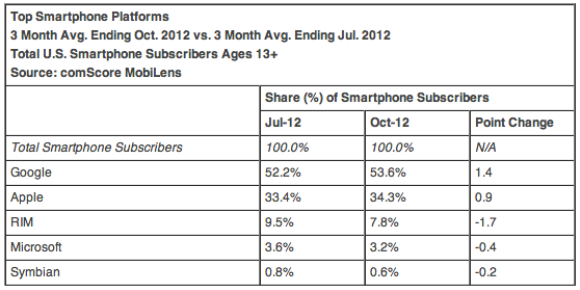 Smartphone manufacturers still have room to grow. The comScore figures indicate that 121.3 million people in the U.S. owned smartphones—a 51.9 percent penetration of the mobile market, which is an increase of 6 percent since July. The survey of 30,000 people also found that after voice calls, text messaging remains the most popular use of smartphone, along with downloading apps and browsing websites, while only a third use it to access social networks.